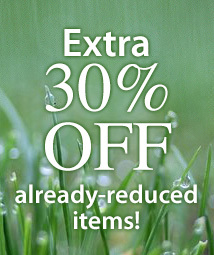 Purr-fect kitties for your home & office! 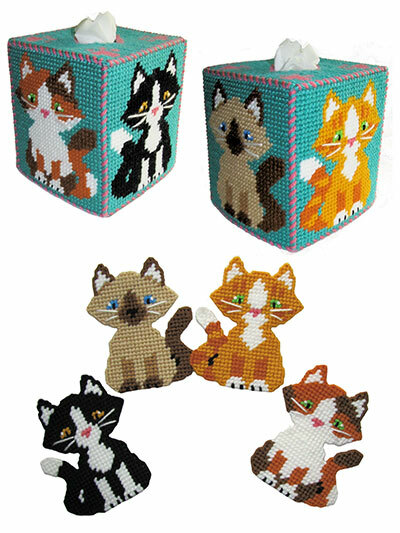 Popular Siamese, calico, tuxedo and tiger kitties with cute "paw prints" on the tissue box top. 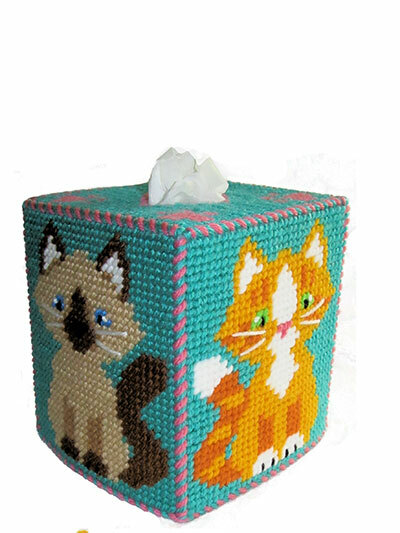 Stitched on 7-count plastic canvas; topper fits a standard boutique tissue box and coasters are 4” square. I absolutely love these Kitty Coasters! They are not only adorable, they are soooo easy to stitch. I'm making two sets for a friend. She, too, thinks they are wonderful! Liked the cute kitties. Am working on them now. Sorry Laurie K. you felt these were "dumb". I made several sets of these for Christmas gifts, and being a seasoned crafter in not just needlecraft, I ALWAYS finish my plastic canvas projects with 1 piece of plain canvas on the back, and tuck my yarn ends in through the rows. That way the back is finished and it works perfect for making coasters. I never leave the back of the projects with the yarn exposed, especially to give to someone else as a gift. 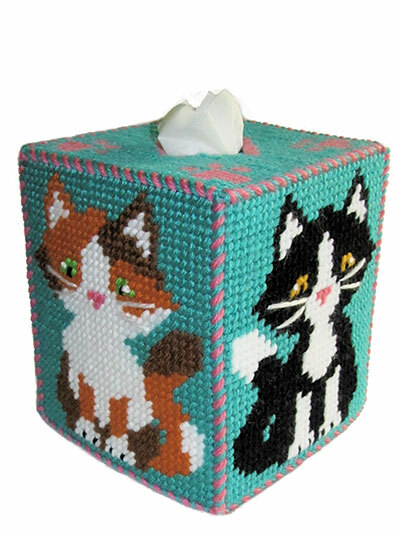 Made the tissue box cover for a friend. Decided not to make coasters because they were dumb. Oddly shaped and no way to make them not come undone on back unless they were covered with felt or something like. They are cute but not made for coasters.